What beats being able to admire these majestic mountains from your hotel room? 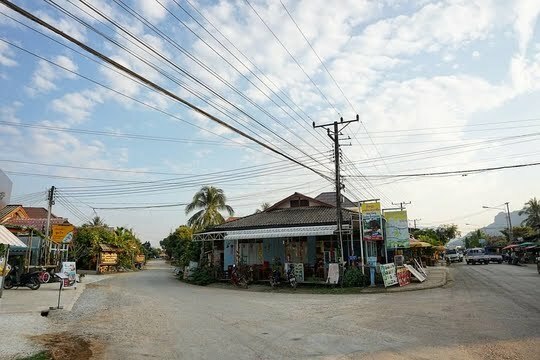 Although this town is probably as touristy as it can possibly get in Laos, it was certainly my favourite stop during my entire trip due to the relaxed atmosphere which emanates throughout the village as well as the multitude of scenic spots and vantage points available to get your ultimate Instagram shot. Let us find out more about how to get to this little town from the capital as well as various modes of transport available to get around town. All the different modes of transport within Vang Vieng can be found in this picture! 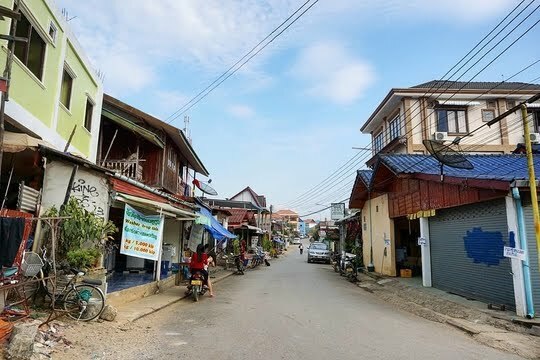 This quaint little town set along the mountains is not served by any airport, thereby resulting in visitors having to take overland transport from other destinations in the region – with most coming from either Vientiane or Luang Prabang. No airports here thankfully - can you imagine the scenery being destroyed by noisy planes? If you are looking for a more authentic travel experience, you may wish to consider commuting to Vang Vieng via local buses which depart from the Central Bus Station and are the cheapest option. However, it is worth noting that these buses are not air-conditioned, possibly leaving you to perspire profusely in the sweltering Southeast Asian heat. You'll be looking at these vehicles enviously and yearning for some A/C! Additionally, this mode of transport oftentimes makes stops to pick up and drop off passengers and culminates in a considerably longer travel duration. Nevertheless, local buses make up for this by offering a local experience where tourists may have the opportunity to interact with locals on this mode of public transport. Almost every accommodation and travel agent located in the capital city will be able to offer travellers various options to make their way up to Vang Vieng, which makes it convenient to head over to this popular town. The journey will be slightly windy and bumpy especially near Vang Vieng, so choose well! Tourists will have the opportunity to choose from a wide variety of land transport choices ranging from minivans to express air-conditioned buses and VIP buses. No advanced booking is required and travellers can feel free to book their transport just hours before departure. Tourist bus options including the express air-conditioned buses and VIP buses are probably the prime option for travellers who wish to enjoy luxurious bus rides with larger leg space and a more comfortable ride. Expect a quick pit stop around 2 hours into the journey to head to the toilet or get some snacks! Just make a left near the middle of Lima Site 6 and you'll be welcomed by this sign into town! 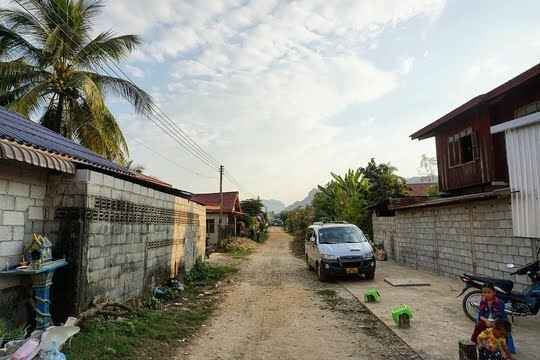 Minivans are certainly the fastest and probably one of the most convenient ways for visitors to make their way to the quaint town of Vang Vieng. As a result, I decided to give these minivans a go on my trip from Vientiane and booked my journey with my hotel at a relatively cheap price of USD 7. The minivan was quite big but got crowded... really quickly! I would recommend travellers opt for this option if they are looking to complete the drive within the shortest time possible. 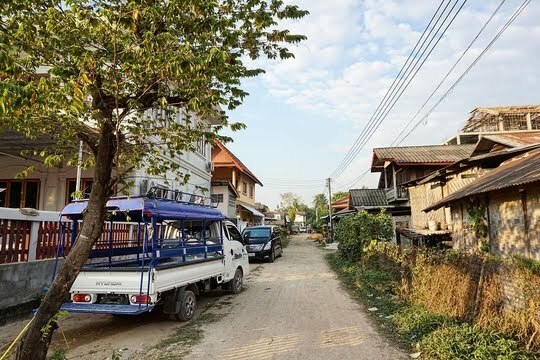 Not only does the package include a tuktuk ride to pick travellers up from their accommodation in Vientiane to the minivan, the journey ends right in front of Malany Villa in the middle of Vang Vieng which makes it easy for passengers to walk to their accommodation along the main road. A few steps away from Malany Villa and I arrived at my accommodation! Even though the minivan ride was rather cramped and quite uncomfortable, the views certainly made up for it as our van made its way through the urban landscapes in the heart of Vientiane cluttered with shops and houses before entering the rural outskirts where the roads became much more windy and hilly with a number of small huts made of straw and bamboo. Peeking out of the window offers travellers a glimpse into the livelihood of the locals living in the mountains who were excited to welcome us into the region. It was quite interesting to see how our driver had tied all our baggage to the top of the minivan and covered the entire pile of luggage with plastic just as one would wrap Christmas gifts. All in all, quite an adventure! 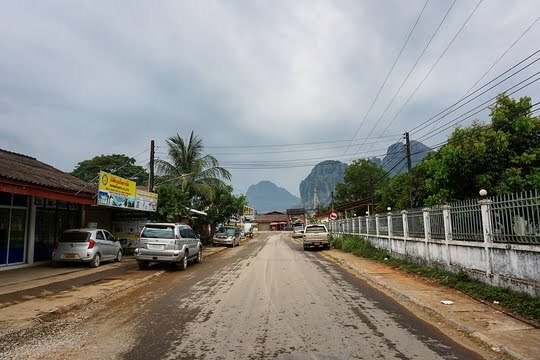 Given the small size of Vang Vieng, the entire town is easily explored on foot from one end to the other. The town is bustling with tourist activities and adorned with beautiful mountains which will motivate travellers to continue strolling down the streets in search of the perfect shot. Not only does walking around the town offer opportunities for travellers to slow down their footsteps and enjoy the relaxed ambience emanating throughout the atmosphere, it also evokes memories reminiscent of the olden days with interesting sights such as a communal well which the locals used back then. Walking around the town in the evening offers cool breezes and allows you to walk off some of the great food you savoured at the restaurants. However, I would recommend that visitors consider walking to attractions as far away as Tham Chang Cave and minimally rent a bicycle to visit any other sights further away. Let's keep walking to the main town of Vang Vieng, shall we? Warning: The roads outside of town are scenic but really long! When visiting attractions which are further away from the town centre, I would highly recommend that travellers rent bicycles which are available at extremely affordable prices – regular bicycles at 15,000 LAK (USD 1.80) and mountain bikes at 30,000 LAK (USD 3.60) per day. Bike rental shops can be found everywhere in Vang Vieng, so pick one and go exploring! Given the fact that many of the roads outside of town are dirt roads which are definitely not well-paved, travellers are advised to get the sturdier mountain bikes instead. This is an alley in the town, so you can imagine how bumpy the roads outside town are like! It is crucial to test ride the bicycles before renting them from the shops as some may have been worn out with wobbly tyres or bad brakes that may result in a disastrous bike ride. Toll fees for bridges will differ for different vehicles, so I'll be covering that in a separate post! 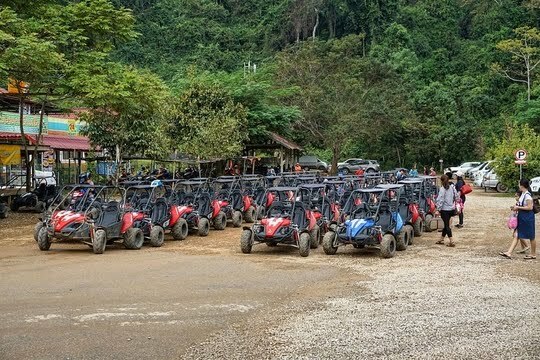 For those who are more adventurous, they may wish to consider renting motorcycles starting at 50,000 LAK (USD 6.00) or even ATV buggies for an entire day to explore dirt tracks outside of the town. However, visitors are advised to be wary of the scam at the gas station nearest to town where the attendants may not reset the pump before filling customers’ tanks which results in a bill being much higher than it ought to be. At least 100 of these buggies passed us on our way to the Blue Lagoon. Wish I had gotten one. 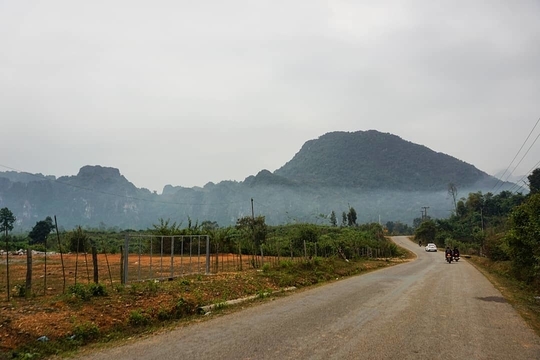 Most of these rental shops will provide a simple map of Vang Vieng and its surrounding area for cyclists and riders to consider visiting, but it may not be a bad idea to check out Hobo Maps that indicates magnificent vantage points and intriguing attractions around the area as well. Motorcycles certainly seem to be the favourite among backpackers. Tuktuks and songthaews only seem to be available in Vang Vieng when travellers are on guided tours that have catered transport, so individuals who intend to explore the outskirts of this area may wish to consider signing up for these tour packages that are readily available at all accommodations for relatively affordable prices with the convenience of being chauffeured around attractions. 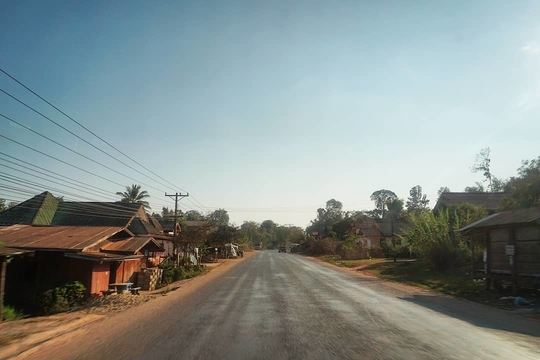 Now that we have made it all the way from the capital of Vientiane to Vang Vieng and are well-versed with the various modes of transport available to get around this little town, we are ready to explore the magic and nature of this beautiful village. Stay tuned as we embark on the most renowned activity that put Vang Vieng on the global map and massively increased the country’s popularity with backpackers! Looking for a comfortable way of getting to Vang Vieng and being chauffeured to the various sights outside of town without any worries? If so, please feel free to check out Klook which is my favourite place to search for affordable tour options for transport, day trips and guided tours in various cities in the world. Download the Klook app on your mobile device to earn extra discounts and rewards! Even I was pretty surprised at the service of minivans not just in Laos but even in Vietnam and Cambodia. 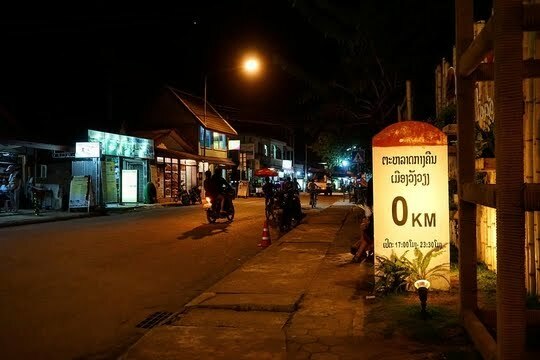 You are right, they are the fastest and the most convenient way to explore Laos. On top of that, they are economical too. Hi Archana, I guess minivans are the prime choice of transportation for most backpackers and tourists who are visiting the Southeast Asian region, as they are much quicker than most other modes including buses and much more affordable than flights. Even though the minivans do not offer a comfortable ride, I highly recommend that visitors consider taking it, as it really shortens the travelling time by a considerable amount so that they are able to explore more of the town during their time rather than being stuck on the road. Glad you share the same opinion! Hey Olivia, Vang Vieng is really an amazing location in the countryside with picturesque natural landscapes all around the town as well as the opportunity to embark on numerous outdoor activities to bring your wild, active side out of you. When in Vang Vieng, do not forget to check out the activity that effectively placed this rural town on the global map and attracted hordes of tourists to visit - tubing! It is definitely awesome to know that there are numerous modes of transport to allow visitors to travel to Vang Vieng, from minivans and local buses to comfortable tourist VIP buses. Even though the ride may not be the most comfortable one, I guarantee you that you will enjoy your time exploring this town as well as its outskirts and admiring the scenic views. Hi Adrianna, glad to hear that you're considering visiting Laos, as this country is really one of the most underrated travel destinations which backpackers oftentimes neglect during their travels around the Southeast Asian region. I'm guessing that you've heard about Vientiane and Luang Prabang which are both famous for their rich culture and heritage, as seen from the immense number of significant temples ('wats'). However, it is Vang Vieng which truly captivated my attention and immediately earned a spot on one of my favourite travel destinations of all time. 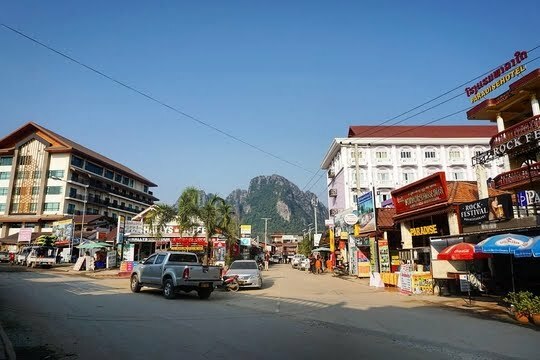 Not only is it home to a wide array of outdoor activities such as kayaking and zip-lining (as well as the all-famous tubing that enabled Vang Vieng to gain global popularity), the town boasts picturesque natural landscapes in all directions that are best admired from spectacular vantage points atop mountains. Do check this little town out - I'm sure you'll enjoy it tremendously! Great tips. I'm such a fan of exploring places on foot I would have to take that option, although a 9km hike out of town might be pushing it, especially on a hot day. The bikes look like a great idea as well. Good to see there are so many options. Hey Nicola, I guess we're the same kind of traveller who enjoys walking around foreign cities and towns so that we are able to exercise that flexibility to stop whenever we wish to explore more and learn more about certain attractions. Walking also creates opportunities to interact with locals whom we meet along a way and sheds light on the livelihood of the locals. However, I am almost certain that you will prefer other modes of transport (a bicycle is a wonderful idea) as they will really make the journey out into the wilderness much more comfortable and manageable and allow you to expend your energy and effort exploring the attractions themselves (rather than just trying to get there). Yeah, travellers to Vang Vieng are certainly spoilt for choice as to how they wish to explore the town and its surroundings! No Tuktuks available when you need them should actually be the title of a book on Laos, given the easygoing mentality of many I came across during my visit. I don't know if things have changed in recent years though. Vang Vieng was one of those places I skipped precisely because I was told it might be too touristy. Now it seems it might have been worth a visit regardless. Your tips will certainly come in handy when I visit again. Hi Denny, I actually heard quite a lot from online reviews by backpackers saying that they did not enjoy Vang Vieng because of the crazy party scene and its booming tourist numbers. In all honesty, I was relatively affected by what they said and was reconsidering my itinerary in the town as I am not much of a party animal and do not really enjoy crowds. However, I am absolutely amazed by the town that offers one of the most picturesque natural landscapes and scenic views that I had ever admired during my travelling escapades. Besides admiring the scenery from fantastic vantage points and viewpoints (I'll be introducing a secret viewpoint in a subsequent post), visitors will also be spoilt for choice for the kind of outdoor activities that they may wish to indulge in - such as kayaking/canoeing, zip-lining and tubing (which allowed this town to gain global popularity). That does sound quite fascinating. I'll be sure to visit Vang Vieng if I ever make my way to Laos again. Perhaps would check with you as well. Man, looks like you had such a great time. The landscape is amazing, with mountains and rice fields! I like your idea of cycling or walking around. Hi Alice, I certainly had an awesome time in Vang Vieng which truly captivated my attention and immediately earned a spot on one of my favourite travel destinations of all time. Not only is it home to a wide array of outdoor activities such as kayaking and zip-lining (as well as the all-famous tubing that enabled the town to gain global popularity), the town boasts picturesque natural landscapes in all directions that are best admired from spectacular vantage points atop mountains. 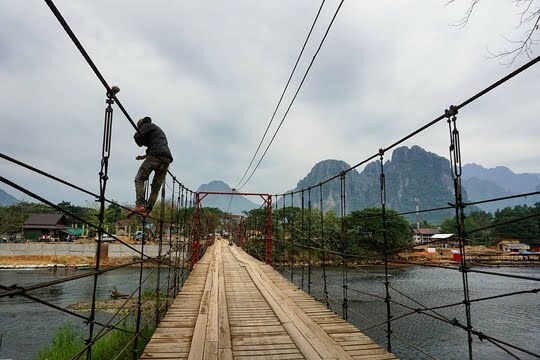 I would highly recommend walking around only within the area of the town centre of Vang Vieng and minimally cycling when visitors are planning to head out to the wilderness on the other river bank of the Nam Song River. This will certainly allow visitors to enjoy a more comfortable, scenic ride on their way to the major attractions and conserve their energy to explore the attractions (rather than getting overly exhausted from just trying to get there). As usual your post take me on an awesome trip... I keep telling my husband we really need to go to this corner of the world! Hey Julz, it's really nice to hear that you've enjoyed this post of mine and are interested to visit Laos. The country not only has a rich culture and heritage as well as amicable locals who are willing to lend a helping hand, but also offers one of the most authentic travel experiences where sights remain raw and untouched - very much contrasting with the prepackaged, commercialised travel industries in many of the developed countries. Being one of the most underrated travel destinations in the region also means that attractions in Laos are not that crowded with tourists and you will probably have the opportunity to get places to yourself as well. Hope you will be able to visit soon - I'm sure you will enjoy yourselves tremendously! 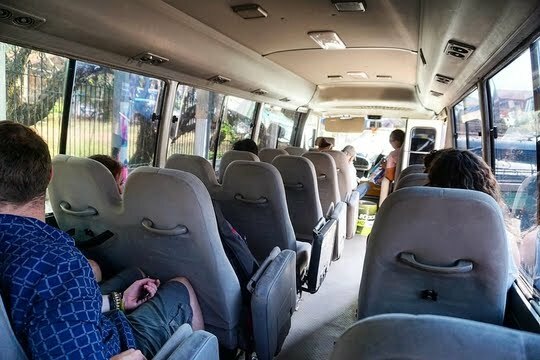 Minivans looks a feasible transport to get around in Vang-Vieng as no booking is required and also the connectivity is good. Bikers must be having fun here as the rent of bike for whole day is very less - just 6USD. As roads outside town are scenic then going through two wheeler must be beautiful. Hobo maps look interesting and very useful for local info. Hi Yukti, I was definitely surprised at the quality of the minivans as they are pretty much value for money and very affordable for the average backpacker who intends to travel around the area on a shoestring budget. Even though the ride may not be very comfortable, I would still recommend that travellers consider taking it, as it really shortens the travelling time by a considerable amount so that they are able to explore more of the town during their time rather than being stuck on the road. 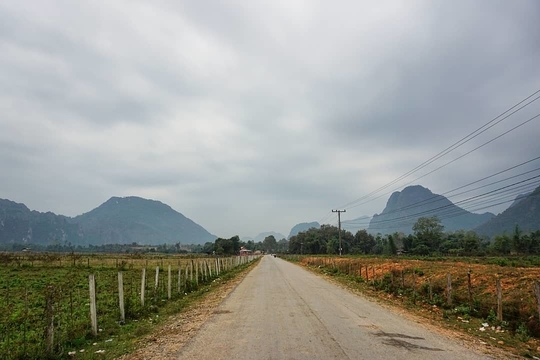 You are right when you say that cyclists will be able to have a ball of a time when they are visiting this little town of Vang Vieng because they will be treated to cycling tracks flanked by massive rice paddy fields and facing picturesque natural landscapes. Given the affordable rental rates for bicycles as well as their massive availability throughout the town, this mode of transport is highly recommended for visitors while heading out to the opposite riverbank. A very off beat destination which i never heard about before. Glad to know the options. I will prefer the bu as option as not too much a fan of pick up and drop off passengers mode of travel .I loved the scenic roads and can only plan a road trip here as soon as possible . Saving the post for my travel. Hobo map is great tool too. Hey there, I guess you are referring to the local buses instead of the tourist VIP buses, since you do not enjoy pick-up and drop-off modes of travel which is understandable. Nevertheless, as mentioned in the post, be prepared for the comparatively longer travelling time as well as the relatively uncomfortable journey (without A/C). You will certainly have the opportunity to interact with the local people who are heading out of Vientiane, which should be quite the experience to immerse yourself in the local culture and atmosphere. 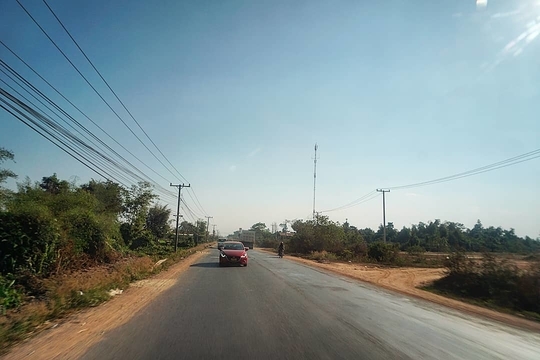 I would say that the journey along the route from Vientiane to Vang Vieng was quite an interesting one when I saw the gradual transition from urban landscapes to beautiful natural scenery. I clearly remember we managed to catch the epic sunset during our journey and everyone was busy snapping pictures of the picturesque, scenic views as we were entering Vang Vieng. It was indeed a "wow" moment when the minivan began buzzing with activity and excited conversations about how amazing the stay in the town was going to be. I love reading about places that I don't know much about, so reading about a Laotian city was really interesting! My favourite photo is of the town at night. It looks like a really relaxed and fun place to spend a holiday! Hi Linda, I'm happy to hear that you enjoyed learning more about Vang Vieng from reading this post of mine. Even though the town remains relatively remote and off the radar for many travellers who are planning to visit Southeast Asia (or even Laos), Vang Vieng actually gained international popularity and attention due to the global buzz caused by its tubing mania that attracted huge hordes of tourists to migrate over to experience the activity for themselves. 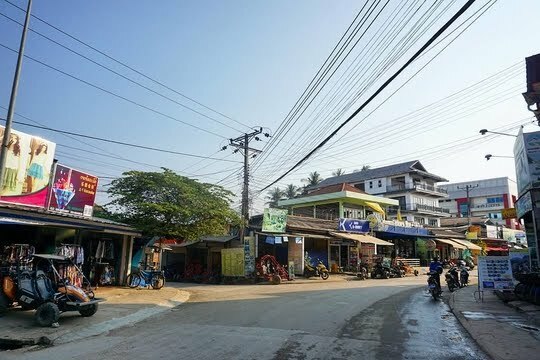 If you are looking to explore somewhere in Laos to learn more about the culture and history, I would certainly recommend that you head over to Luang Prabang (the entire city is a UNESCO World Heritage Site) or Vientiane (the capital which boasts a wide array of temples scattered across the entire urban landscape). However, if you are in search of a relaxing getaway to escape from the hustle and bustle of city life, Vang Vieng is definitely the place to go with its myriad outdoor activities and spectacular vantage points to admire amazing scenery. I've heard that getting there is challenging, and it seems so. Things in Laos don't seemed to have changed too much yet. And for that I've glad. 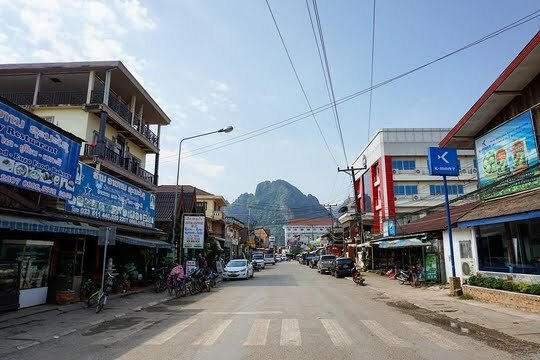 Hi Kai Lun, getting to Vang Vieng is certainly not that challenging as many tour operators and bus companies have commenced ferry services from major cities such as Vientiane and Luang Prabang to this backpacker haven, so heading over should be a relatively simple, convenient task for most visitors. Even though the country is undergoing economic progress and rapidly developing its urban landscapes, Vang Vieng appears to retain its rustic, quaint feel and vibe which accentuates its beauty and relaxed atmosphere. It's certainly a great getaway from the hustle and bustle of city life and a fantastic travel destination to enjoy outdoor activities and the picturesque natural landscapes all over. Wow, Vang Vieng looks wonderful! I like how you also provide tips on transportation, and also give an honest opinion of the minibus, and the roads too. I like cycling, but will take your advice when trying to see the local sights. Such a lovely looking country, I really hope to see Laos one day. Hey Lisa, thank you for your lovely comment! Whilst planning for my itinerary, I found that the details on the various modes of transportation seem to be rather inaccurate and do not correspond with the online reviews by backpackers and other travellers. (Buses are advertised to take 3 hours, but the journey definitely takes longer than that.) As a result, I hope that by consolidating the information and insights that I have garnered from my travels, I will be able to help those who are planning to visit this part of the country to have a better understanding of what to expect. I'm sure that cyclists like yourself will be able to have a ball of a time when they are visiting this little town of Vang Vieng because they will be treated to cycling tracks flanked by massive rice paddy fields and facing picturesque natural landscapes. Given the affordable rental rates for bicycles as well as their massive availability throughout the town, this mode of transport is highly recommended for visitors while heading out to the opposite riverbank. When you are exploring the town, walking will definitely suffice as it's a very small town - I walked from one end to the other in less than 15 minutes! Van Vieng seems like a really interesting place. I love your photo of the ox! The minibus seems quite efficient even if it's not that comfortable. I might want to try the tourist bus for comfort even if it is slower. 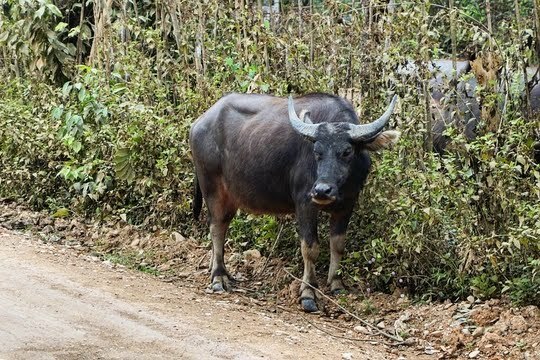 Hey Stella, if you love that picture of the ox, you will certainly enjoy my subsequent post on exploring the wilderness on the other riverbank of the Nam Song River as I stumbled upon a wide variety of cattle and animals whilst walking to major attractions. Coupled with the amazing natural landscapes that this town has been blessed with, Vang Vieng certainly offered me a haven and solace to escape from the busy urban city life. No wonder, some backpackers have said that they stayed for months when they originally only planned to stay for a day or two. I totally understand your concerns regarding comfort, so you may wish to consider taking the tourist VIP bus where you will be able to have a cosy ride out of the capital to this backpacker haven. 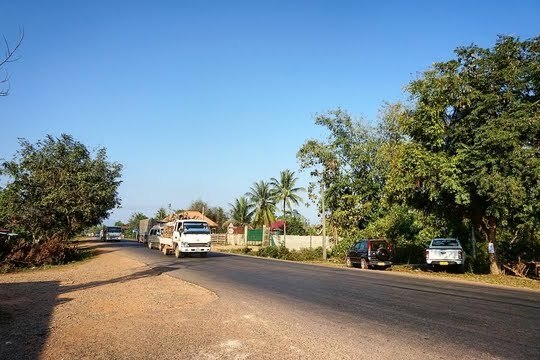 As transport to and fro Vang Vieng can only be done overland, you may want to try out another mode of transport such as the minivan when you're leaving the town to other regions of the country such as Luang Prabang so that you will be able to make the comparison. This looks amazing. I appreciate you laying out the different options. It's always so hard when going to a new place and trying to figure out the best ways to get around - so this was very useful! Thanks for sharing. Hey there, thank you for your lovely comment. I totally understand what you mean, as I was actually quite confused when I was planning for my itinerary and found that the details on the various modes of transportation seem to be rather inaccurate and do not correspond with the online reviews by backpackers and other travellers. Buses are advertised to take 3 hours, but the journey definitely takes longer than that. As a result, I hope that by consolidating the information and insights that I have garnered from my travels, I will be able to help those who are planning to visit this part of the country to have a better understanding of what to expect. Glad to hear that you found my post useful - certainly hope that you'll be able to visit this country and experience it for yourself. I love visiting small towns in between big cities. Vang Veing seems like one of them to me. Relaxed, scenic and easy to reach! I am glad transportation is readily available. Getting around town on a rented bicycle sounds perfect. I would love to visit this small town. Thanks for providing this complete guide. Vang Vieng is definitely the town for you, if you love visiting these small little towns in the countryside. 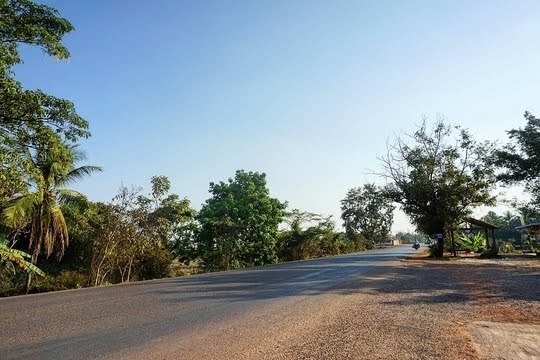 It is certainly the perfect destination besides the fact that it is able to split up the long overland journey between Vientiane (the international entry point for most visitors) and Luang Prabang (the renowned UNESCO World Heritage Site). Not only is it home to a wide array of outdoor activities such as kayaking and zip-lining (as well as the all-famous tubing that enabled Vang Vieng to gain global popularity), the town boasts picturesque natural landscapes in all directions that are best admired from spectacular vantage points atop mountains. Cycling out into the wilderness on the other riverbank of the Nam Song will certainly be an epic adventure where you will be treated to amazing views of the rice paddy fields flanking the path as well as the mountainous landscapes lying ahead. I'm sure you'll enjoy it tremendously! The more I am reading about Laos in your blog, the more I am attracted to visit it as soon as possible! I would love to visit Vang Vieng despite the touristy frills! I am a cycling fan and happy to know that it is cycling friendly! I loved all the tricks and tips you shared here! Hi Abhinav, great to hear that you're interested and inspired to visit Laos after checking out my series on the attractions and experiences that this charming little country has to offer. One of the most underrated travel destinations in the Southeast Asian region, Laos not only has a rich culture and heritage as well as friendly locals who are always willing to share their stories, but also offers one of the most authentic travel experiences where sights retain their raw, untouched appearance just as they were constructed and built. Nevertheless, it was Vang Vieng that which truly captivated my attention and immediately earned a spot on one of my favourite travel destinations of all time. This town hosts a wide array of outdoor activities that will definitely interest even the most sedentary of individuals from kayaking and zip-lining to the all-famous tubing that helped Vang Vieng gain global popularity with backpackers. Beyond sports, the town boasts picturesque natural landscapes in all directions that are best admired from spectacular vantage points atop mountains. Do check this little town out - I'm sure you'll enjoy it tremendously! Hey Patricia and Miguel, I had one of the most amazing hiking experiences in Vang Vieng as I managed to locate a secret viewpoint that many travellers and backpackers are not aware of. (I actually had the entire peak of the hill all to myself during my visit.) The mountainous landscapes surrounding me were absolutely amazing and looking down upon the rice paddy fields that don the lands just further accentuated the beauty of this area. Do keep a lookout for my subsequent post on hiking to that viewpoint, as I am sure that you'll love it tremendously since you enjoy beautiful natural scenery and landscapes. 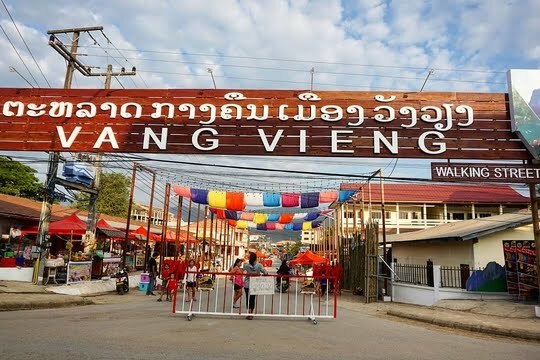 Hope you'll be able to visit this vibrant town to take in all the sights and sounds and embark on the myriad adventures and experiences that Vang Vieng has to offer. Thanks for listing all of these options. I think I would prefer a minivan just for the convenience. I love to walk through a town, but I would probably also want to rent a sturdy mountain bike, given some of the distance between locations. However, it might be really amusing to watch me trying to ride the bike. Hey Lance, I guess we're the same kind of traveller who enjoys walking around foreign cities and towns so that we are able to exercise that flexibility to stop whenever we wish to explore more and learn more about certain attractions. Walking also creates opportunities to interact with locals whom we meet along a way and sheds light on the livelihood of the locals. I'm not sure how confident you are on the bicycle and the unevenness of the cycling tracks may pose some difficulty for inexperienced cyclists (the reason why I chose to play it safe instead of risking having bruises for the rest of my trip). However, if you are fine, bicycles will be a wonderful idea as they will really make the journey out into the wilderness much more comfortable and manageable and allow you to expend your energy and effort exploring the attractions themselves (rather than just trying to get there). I would really love to try backpacking someday. We travel but normally to just famous landmarks and touristy spots. I wish I have more time and have the luxury to experience something like trying their local transport and not through a guided tour. If you had shown me just the photos, I would have just assumed the place to be my country, India! The roads, the wirings, the greenery, living in tandem with oxens & dogs, country-side dirt tracks....... very much India!!! Riding on one of the ATV buggies on the dirt track to explore sounds like a totally fun way to explore Vang Vieng! Even riding on bicycles, despite the uneveness of the track, would be so much fun and you really would be able to see so much of the place and explore everyday life. Good to know it's best to test out the bicycles before you leave the shop. Knowing me...I'd be wayyy to excited to explore, that I'd forget to test to make sure things like the wheels are ok! Ohhh Vang Vieng! One of my favorite place of Laos! When I was there in 2011 it was crazy with crapbackers getting drunk all around the town. I wonder if it has changed? We lived on the other side of the river and I remember driving our motocycle on the tiny FREE bridge because we didnt want to pay on the other bridge. Love Vang Vieng! Tuk tuks are never around when yo need them the most.. haha... I remember my trip to Luang Prabang. It was the best ever. However, I'm yet to explore Vang Vieng. Saving it for next year... Cheers!! Nice to see some street photography in the travel blog. Most bloggers just show the highlights, but you show the actual life. A question I always ask, how do people react when they are photographed? I'll admit to being impressed at the number of transportation options. Vang Vieng looks like a beautiful place, would enjoy photographing it. And trying out one of the ATVs! That's a good article for people who are looking to travel in Vang vieng . The mini vans are the best option no doubt no need to stand in longer lines or worry about booking the ride.